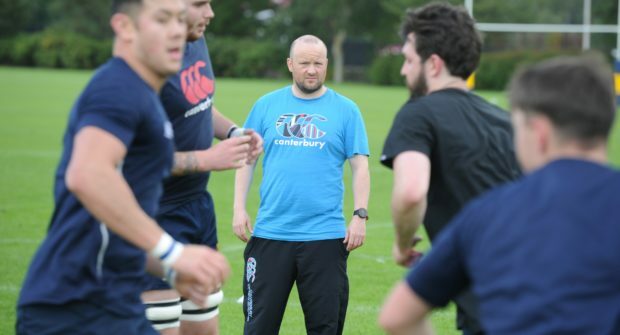 Gordonians head coach Ryan Morrice. Gordonians can take one step towards the National 3 title and with it, a place in National 2 next season, if they can win the top of the table clash at Newton Stewart tomorrow. Ryan Morrice has guided his club to a six point lead at the top of the table with a game in hand on their nearest challengers and with West of Scotland and Ardrossan Academicals, who are third and fourth respectively, 21 points behind the race for the championship has become a two-horse race. Gordonians head coach Morrice knows tomorrow’s game is the biggest game of the season for his side. He said: “We can’t hide behind the fact this is a big game. It’s the top two in the division but this is the sort of game which we’ve worked so hard for this season. “We want to be involved in those big games and we know this one in particular will go a long way to determining how the season is going to pan out. “We know with us having a game in hand on Newton Stewart it is a match they need to win more than we do but there is pressure on both sides. Gordonians edged a low scoring affair 8-5 when the two sides met in Aberdeen on October 6 and Morrice is expecting another keenly contested encounter at Bladnoch Park in Wigtown. He said: “We know what we’re getting on Saturday after the earlier game between us. We defended most of the game at Countesswells and we didn’t create much attacking opportunities which was disappointing. We felt we let ourselves down on that front but we retained possession well and were able to grind out the win. “We know they have got a very good defensive record and are strong at home. The weather can turn in an instant in the West of Scotland but we can go there with confidence regardless of the conditions. “We’ve got a strong squad for the game and it’s pleasing to see so many guys put their hand up and want to be involved in this one. It’s a good problem to have but I know a few guys are going to be disappointed when the final team is selected. Meanwhile, Caithness captain Marc Anderson is hoping his side can close the gap on fifth-placed Carrick when they meetin National 3 in Ayrshire this weekend. Anderson said: “It’s going to be a tough test for us down there. We managed to beat them on home soil up in Thurso earlier in the season but we know they are a really good side. “We were on top in the home game in October when we ran out 57-12 winners but I am expecting a much closer game this time around. “We had an unexpected week off last weekend when our opponents St. Boswells, were unable to raise a team for the trip to Thurso.